Natural flora manufacturers and exporters of romantic gifts, valentines unique gifts, anniversary gifts, birthday gifts, online flowers and roses, real rose dipped in 24kt gold, silver, copper, 24kt Gold rose, Silver rose, copper rose, silver dipped natural rose delivered in india and worldwide. We accept all major credit cards like VISA, MASTER CARD, AMERICAN EXPRESS, DINERS CLUB, CITIBANK E-CARDS, JCB CARDS. Our Payment Gateway is secured through VeriSign 128 bit Secure Sockets Layer protocol (SSL) . Natural Flora provides the best quality, best price and quick deliveries of 24kt gold plated natural roses, silver roses, copper roses. For Bulk Prices contact us. 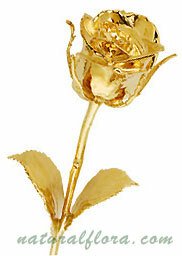 11 inches real rose dipped in Gold, fully handcrafted. As no rose is similar, shape differ from stem to stem. * Price Per unit. Freight included.